The great culture of India has been built on the foundations of the spiritual, intellectual and creative contributions of the sages, seers and philosophers, Who have inspired, shaped and established the world-vision and heritage of the country. One such luminary on the cultural horizon of India is Shankara or Sri Shankaracharya, who is sometimes reverently referred to as Sri Shankara Bhagavatpada. 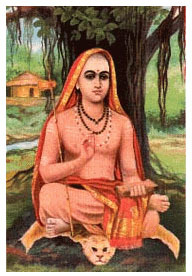 Shankara was a poet, writer, thinker, and philosopher, mystic and Hindu religious leader. His contributions to the religious and cultural revival of India at a very critical period of its religious history were unique. His influence is still vibrant in the minds and hearts of the Indian people. We do not have very reliable records of the details of Shankara’s life except the biographies written long after his life time by his own devotees. These biographies are often shrouded in myths, as the devotees wanted to give a halo of holiness to his religious achievements. However, even if we eliminate the mythical elements from his biographic descriptions we get a picture of a person with exceptional intellectual and spiritual abilities and human virtues that would make him a unique person. Shankara was born in the year 788 AD in an orthodox Namboothiri Brahmin family in the village of Kaladi, in Kerala, South India. He was the only child of Shivaguru and Aryamba. His father served in the local Shiva temple. Before he was seven, his father died and so he was brought up in strict Brahmin tradition by his mother. He received his early education under a guru, staying in the guru’s house in accordance with the prevailing custom, the so-called “Guru Kula”. He was acknowledged as a child prodigy who mastered his mother tongue, Malayalam and the priestly language, Sanskrit, ( the latter to comprehend and to explain the Hindu scriptures, the Vedas), by the age of eight. From the age of eight he cherished a strong desire to pursue the ascetic way of life of the sanyasi so that he could devote more time to the study of Vedanta. As his mother wanted to have her son always with her as a help, especially at the time of her death for the burial services, it was difficult for him to persuade his mother to agree to his becoming a sanyasi. However, he managed to get her permission, and bade farewell to her, promising that he would be with her at her death-bed. From Kaladi, Shankara traveled on foot all the way to the bank of river Narmada, to meet the great guru Govinda Bhagavatpada, with a view to getting initiated to the life of a sanyasi. Govinda formally admitted him to the sanyasin order, according to the prescribed rituals and guided him in the study of Vedanta. Shankara carried on his study with devotion. He comprehended the mysterious secrets of Vedanta in a profound way. But in order to become a guru he had to attain the state of “Spiritual Yoga” -the capacity to forget himself and the world in order to enter the indescribable experience of peace. Govinda Bhagavatpada imparted to him the Brahma Vidhya that enabled him to attain this state of glorious experience, the experience of the Infinite, the Brahman. Govinda then asked Shankara to write, in the light of the truth he realized, commentaries for the three basic texts, namely, Upanishads, Bhagavad Gita and Brahma Sutras (Vedantas), the three basic pillars of Indian spirituality. Shankara went to Kashi (Varanasi) to engage himself in writing the commentaries of the Upanishads, Bhagavad Gita and Vedanta, as commissioned by his Guru Govinda. Once the commentaries were completed, he entered another phase of his life; he started his mission of spreading the teachings of the commentaries he had written. As many so-called teachers of the religion were attacking the basic understanding of the Vedic scriptures, it was the need of the times that he should launch his mission of refuting the wrong teachings and restore the genuine ones. His biographers call this period of his life as the period of conquest, “Digvijaya”. He moved about the length and breadth of India debating with scholars of the other philosophic systems. He defeated all opponents by the depth of his philosophic and Vedic knowledge and by his logical acumen. He also defeated the notorious tantric Kapalika, Ugra Bhairava, and other black magicians of his times by his spiritual and yogic power. at the four corners of India for spreading Vedanta and for guiding the followers of Vedanta as seats (peethas) of the patron god/goddess of learning or wisdom. The first monastery was Sharada peetha at Sringeri in Karnataka (South); the second, Jyothis peetha at Badari, in the Himalayas (North); the third, Kalika peetha at Dwaraka (West); and the fourth, Govarthana peetha at Jagannath (East). He installed his four prominent disciples, Sureswars, Trataka, Padmanada and Hastamalaka as the chiefs of the four centers respectively. He established a fifth Matha at Kanchipura, near Madras, Kamakoti peetha, which he himself took charge of and where, according to some, he spent his last days. Meanwhile, Shankara had the premonition that his mother was about to die and he rushed to Kaladi to be at the bed side of his dying mother. When she died he performed her funeral rites, which normally a sanyasi was not allowed to do. After the funeral he returned to Sringeri. His final exploit was his visit to Sharada Nilayam in Kashmir, known as the Sarvajna peetha (the seat of the all-knowing). Scholars from all over the country, proponents of the various philosophical systems, were in the premises of the building when Shankara arrived at the place. These scholars confronted him, but Shankara defeated all of them and entered the Nilayam through its Southern gate (Sharada Nilayam had four gates from the four directions) to ascend to the Sarvajna peetha. Shankara died at the age of 32 in the year 820 A.D. Many places, like Kanchi, Thrissur and Kedar claim to be his place of samadhi, but there is no conclusive evidence to any of these claims. Shankara lived only a very short 32 years, but what he had achieved transcends the brevity his life-time and the length and breadth of India. To understand the Advaida Vedanta as interpreted and developed by Shankara, we have to look at it in the context of the six basic philosophic systems of ancient India. These six systems are: Nyaya, Vaiseshika, Samkya, Yoga, (Purva)Mimamsa, and (Uttara Mimamsa)Vedanta. Six Rishis,Gotoma,Kanada,Patanjali, Kapila, Jaimini, and Vyasa respectively were supposed to have formulated these systems. All these systems accept the authority of Vedas, the reality of Brahman, the Self, the law of Karma and Mukthi/Moksha (liberation) through spiritual discipline/true knowledge. All these systems generally acknowledge the importance of the logical and scientific analysis of knowledge in the Nyaya system, the rational analysis of cosmology, knowledge and truth in the Samkya system and the attainment of transcendental knowledge through yogic meditation for liberation in the Yoga system. While some of the systems accept the dual reality of Purusha and Prakrithi, and the duality of Paramatma and Jeevathma, the advaida system holds that Reality is but one not dual entity. However the Vedanta makes use of the Samkya-Yoga cosmology and epistemology and the yogic practices to attain transcendental knowledge. The apparent duality of reality, according to Vedanta, is only an illusion, maya/avidya. 1. Brahma Satyam, Jagan Mithya, Jeevo Brahmaiva Na Apara. (Brahman alone is real, this world is unreal, Jeeva (individual soul) is identical with Brahman). 2. Brahman cannot be described, because description implies distinction: Brahman cannot be distinguished from any other than himself. Satyam (truth), jnanam (knowledge), anantam (eternity), are not separate attributes; they form the very essence of Brahman. Similarly sat (real), chit (conscious), and ananda (happy) constitute the essence (svarupa) of Brahman. 3. The world is not mere illusion; it is relative real (vyavaharika satta), while Brahman is the Absolute real (Paramarthika satta). The changing Brahman appears as changing world through Maya which is real-unreal (sat-asat) The reality behind all the phenomenal (vyavaharika) activities is Brahman. 4. The nature of Brahman is pure Consciousness - eternal, all-pervading, formless (nirakara), without attributes (nirvisesha) based on the Upanishadic sayings, Aham Brahmasmi (I am Brahman), Tat Tvam Asi (Thou art that). 5. Final liberation (Mukti/Moksha) comes from the knowledge of the unity of individual soul and the Eternal Soul through meditation, transcendental knowledge and samadhi through Yoga. Sree Shankaracharya brought about a real revival of knowledge, spirituality and culture all over India. He will always be remembered as one of the most brilliant jnana yogi and karma yogi of all times. The various vidya peethas he established continue the work he successfully carried out during his times. Sri Shankara Sanskrit University at his birth place, Kaladi, was established in the latter part of the 20th century and is indeed a symbol of the honor, respect, and appreciation that the contemporary people in India have for what Shankara had done for the country through his major centers of learning. Let the wisdom and spirit of this saint inspire the people of India and people all over the world to achieve an integrated vision of the reality of the universe and the world!